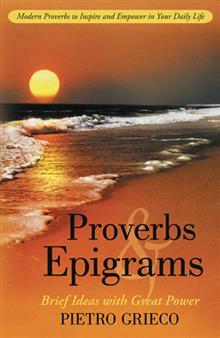 Dog Eared Publicity is pleased to bring you Pietro Grieco's PROVERBS & EPIGRAMS Book Tour! “Concentrate on the surrounding conditions you want to produce, and avoid excuses for not living a fruitful life.” Pietro Grieco believes proverbs and epigrams can be used as stepping stones, seeds of inspiration, and sparks of creativity. With the idea of inspiring and empowering others, Pietro shares a compilation of over two hundred meaningful sayings that he hopes can help people discover fortitude, elevation, and joy within daily living. Grieco, a doctor of divinity and the president of the Foundation for Development of Spiritual Thinking, relies on both his personal and professional experiences as he offers condensed gems of positive wisdom that can be perused either by theme or randomly as affirmations, meditations, or reflections. Through his thoughtful writings, Grieco subtly encourages us to practice consistent mindfulness while musing about such relatable themes as suffering, gratitude, humility, prayer, forgiveness, and transformation. Proverbs and Epigrams: Brief Ideas with Great Power provides inspiration for anyone ready to be lifted up by a new perspective on life. Pietro Grieco is author of The Boy and the Prophet, as well as eight other books in Spanish. He is a doctor of divinity and holds both an OBD in administration sciences and a master of arts degree in literature and writing. He has taught at the college level in Argentina and the United States and is the founder and president of the Foundation for Development of Spiritual Thinking.